In 2016, Communities in Action partnered with the Toronto Centre for Active Transportation on an Active Neighbourhoods Canada project that looked at how to make a section of county road outside Haliburton Village a more complete street. The project included community consultation and local professional input and resulted in a final report that recommends ways to make this road a safer and more attractive multi-modal corridor. The Haliburton Active Transportation Plan was initially written in 2009, and updated in 2014. 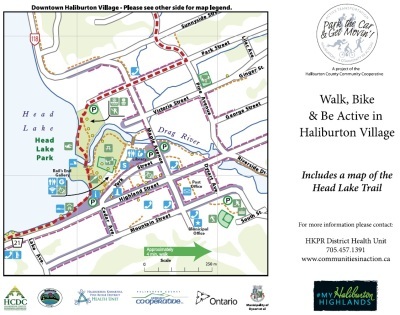 Click to view the 2014 Haliburton Addendum. The Minden Active Transportation Plan was written in 2008, and updated in 2014. Click to view the 2014 Minden Addendum. The County and local municipalities have made big investments that have improved infrastructure for active transportation. 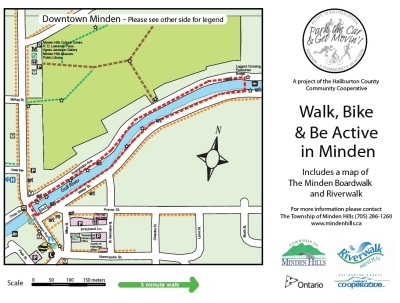 Click here for before and after images of Haliburton Village and here for before and after images of Minden.